Does color matter? Color may not be the most important factor in musky fishing, but it directly impacts your confidence, and confidence is a key component in musky fishing. Jim Saric and Trophy Hunter Tom Sullivan discuss lure color changes in relation to light, wind and water color. Every spring can be a rollercoaster ride in your attempt to locate muskies. With water temperatures rising during the day and falling at night, you may catch muskies in open water in the morning and in weeds in the afternoon, and vice-versa the next day. You have to pay close attention to what is happening around you. Jim Saric and Jon Mathews from Mercury Marine reveal an approach for keeping in close contact with the muskies. When you finally hook that giant musky, the last thing you need is something to go wrong when landing that trophy. Jim Saric, Pro Guide Mike Lazarus, and Trophy Hunter Tom Sullivan highlight the ins and outs of a proper game plan for safely landing and releasing muskies. Lake of the Woods (LOW) is truly Lake of the Muskies. However, LOW’s giant size and thousands of islands can make both navigating and finding muskies difficult. Jim Saric and Musky Hunters John Mich and Marc Ericksen simplify musky fishing on LOW by using lessons learned over the years at the University of Esox. As the water temperatures drop in fall, one thing you can count on is a movement of muskies toward the shallow water. It is amazing how shallow the muskies can be located. One of the most productive areas at this time of year are rocks. Jim Saric and Jim Stewart from The Musky Shop dissect fishing various rocky areas in a myriad of conditions from flat calm and sunny to cloudy and windy. Eagle Lake is legendary in musky lore, and has historically produced some of the largest muskies of all time. A renaissance has occurred over the last several years where the lake not only still produces trophy muskies, but also has seen an increase in overall numbers. Jim Saric, and Pro Guides Steve Herbeck and Danny Herbeck from Andy Meyer’s Lodge outline a solid gameplan for success on Eagle Lake. With the explosion of muskies throughout the US, numerous waters exist adjacent to major metropolitan areas. Although these waters can be productive, the large number of anglers fishing them calls for a slightly different approach to be successful. First, Jim Saric and Musky Hunter Charlie Buhler hit a water near Milwaukee, WI. 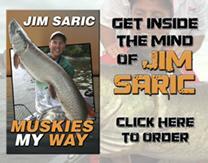 Then Jim Saric and Musky Hunter Phil Gutman fish a popular water in the Chicago area. Weather conditions and fish activity will always dictate your tactics. Although a run-and-gun approach works best on many days, sometimes it’s best to slow down and hit the breaks. First, Jim Saric and Pro Guide Mike Hulbert hit the water in Spring during post-frontal conditions. Then Jim Saric and Pro Guide Brad Hoppe tackle a major fall cold snap. 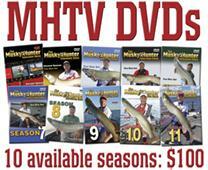 In many southern waters, musky fishing is a year-round activity, as there is no successful reproduction. These waters exist based on stocking and catch and release. Yet, in spring, musky location still depends upon the spawning ritual. First, Jim Saric and Pro Guides Gregg Thomas and Tony Grant troll a Kentucky reservoir for some ice out muskies. Then Jim Saric and Pro Guide Chad Cain try to solve the post-spawn mystery. Every fall, muskies in rivers migrate as a result of falling water temperatures. Some resident populations move to follow food. In rivers adjacent to the Great Lakes, there is a migration of muskies out of the Lakes and into the rivers in search of food and ultimately to stage adjacent to spawning areas. Jim Saric, Pro Guide Mike Lazarus and Trophy Hunter Tom Sullivan explore multiple trolling options in big rivers in pursuit of the migrating musky. You can never underestimate the importance of communicating with your fishing partner. No matter what the season, it’s imperative that all anglers use lures that complement one another based on the conditions and your objectives. For example, if you are searching for active fish, everyone must use fast-moving lures. Jim Saric and Musky Hunter John Mich cover the advantages of using various lures that complement one-another, and the situations when they are most productive.